Jennifer Wilson, right, one of the organizers of the Reverse Mass Mob, boards the bus from her church, St. Suzanne-Our Lady Gate of Heaven in Detroit, with Sister Cheryl Liske, OP. 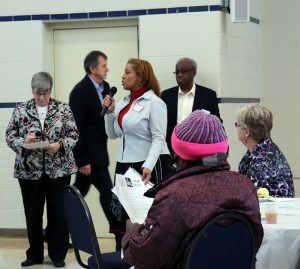 November 13, 2018, Detroit, Michigan – In a nation too often fraught with division and violence, parishioners from two Detroit parishes and one suburban parish got together on Sunday, November 4, to share “sacred conversations” and begin the process of unity between African-American and Caucasian Catholics, city and suburban parishes. In a “Reverse Mass Mob,” more than 50 parishioners of Detroit parishes St. Suzanne-Our Lady Gate of Heaven and Christ the King took a bus to St. Mary of the Hills Parish in the suburb of Rochester Hills, Michigan, to attend Mass and begin “sacred conversations” about their personal experience of race and racism. Jennifer Wilson opens the session by describing her own difficult experience of racism. Jennifer served on a committee of parishioners who planned the event, spearheaded by Sister Cheryl Liske, OP, a community organizer with Gamaliel of Michigan. The committee was made up of members of the two parishes, including Rose Nabongo, Carolyn Nash, Ruth Remus, Ron Eady, and Ben Washburn. Also involved were members of Metropolitan Organizing Strategy Enabling Strength (MOSES), a community organizing nonprofit. 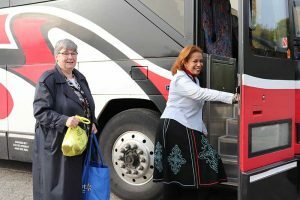 The Adrian Dominican Congregation supported the effort by paying for the bus, in light of the Congregation’s 2016 Chapter Enactment on Racism and Diversity, and through the leadership of Sister Cheryl. Other Adrian Dominican Sisters supported the event through their participation. The spirit of unity in the face of racism permeated the morning and early afternoon. During Masses at both St. Suzanne-Our Lady Gate of Heaven and St. Mary, Father Victor Clore preached on sacred conversations. The pastor of both St. Suzanne-Our Lady Gate of Heaven and Christ the King, he framed the dialogue between Jesus and a scribe in the day’s Gospel as a sacred dialogue in which people share their truths and learn from one another. Father Stanley Ulman, pastor of St. Mary, had prepared the suburban parishioners for the event in a letter in the parish bulletin. “I hope that our common worship will make us more aware of our urban brothers and sisters in the faith and help all of us to bridge the gap that exists within our Catholic faith community,” he wrote. 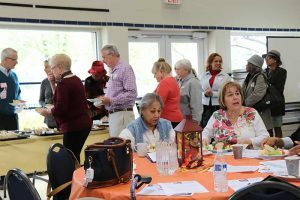 Participants from the Detroit parishes and St. Mary of the Hills Parish in Rochester Hills pick up lunch and prepare for their sacred conversation. Jennifer led the parishioners in their sacred conversations by sharing her own painful personal experience of racism. Participants were invited to do the same with the others at their tables – mixed groups of city and suburban parishioners. Sister Cheryl Liske, OP, speaks to the assembly about the benefits of sacred conversations. The sacred conversations are only the start of an intentional effort by the parishioners to continue the process of honesty and unity. The brief session ended with a commitment by members of St. Mary Parish to travel to St. Suzanne-Our Lady Gate of Heaven Church to plan together for a similar effort next year. Participants took the time days after the event to reflect on what the Reverse Mass Mob had meant to them. “What surprised me the most was the discovery of folks who are part of St. Mary of the Hills’ parish who have themselves experienced racism because of their cultural background – Hispanic, Asian etc.,” said Sister Anneliese Sinnott, OP, of St. Suzanne-Our Lady Gate of Heaven Parish. 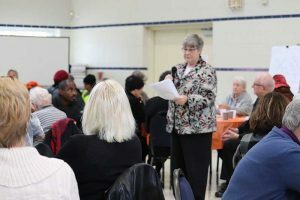 Ruth Remus, a parishioner of St. Suzanne-Our Lady Gate of Heaven and Christ the King Parishes in Detroit, found the Reverse Mass Mob to be “spiritually uplifting and an exciting time to be together in church.” The event “definitely began a conversation between city and suburban Catholic churches on racism,” she said. Another urban parishioner, Darlene Brooks said she has been part of the sacred conversations since the beginning. “Our encounter with St. Mary of the Hills was indeed inspiring and gave me a reason to hope for the future,” she said, adding that the Reverse Mass Mob reminded her of the words to the song Love Train. “The words call on people all over the world to get on board,” she said. Sister Grace Keane, OSF, Christian Service Coordinator for St. Mary of the Hills Parish, helped to organize the event. She was especially surprised by the size of the crowd and by the number of parishioners who were willing to serve on the committee. “The table conversation was varied, impactful, and left one determined to dig deep into enduring racial issues,” she said. Denis Naeger, also of St. Mary of the Hills, noted that the attendance – at more than 60, twice the number expected – was a blessing. He added he is “looking forward to the reverse mob Mass experience in Detroit” next year.